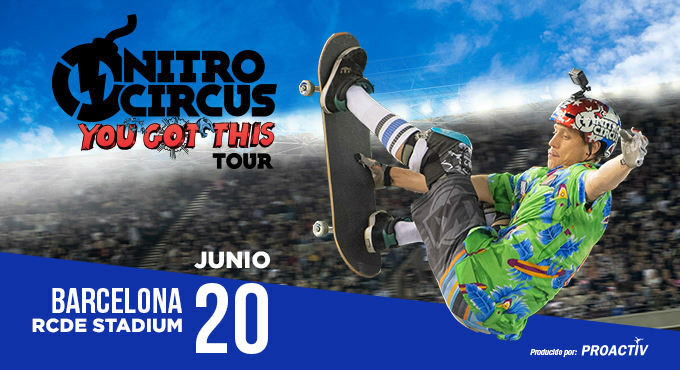 After touring the globe in 2018, Nitro Circus arrives with You Got This, an exciting reinvention of their world-famous live show. In June in Madrid and Barcelona. Nitro Circus “You Got This”, the adrenaline-charged event featuring the best athletes in FMX, BMX, Skate, Scooter and more, including multiple X Games medalists. They will attempt record-breaking feats and spectacular stunts for an action-packed show that is fun for fans of all ages. You Got This debuted last year in legendary arenas like London’s O2, but now Nitro is taking the roof off as the show moves outdoors for the first time. There are no limits! Its huge stage set features the Giganta ramp – now with its biggest takeoff yet – launching riders five stories into the air. The all-star roster will also send it with jaw-dropping tricks you won’t see anywhere else, plus look out as Nitro’s daredevils ride crazy new contraptions. With this crew anything can happen! You Got This is the show you don’t want to miss, with more thrills, spills and fun than ever before. 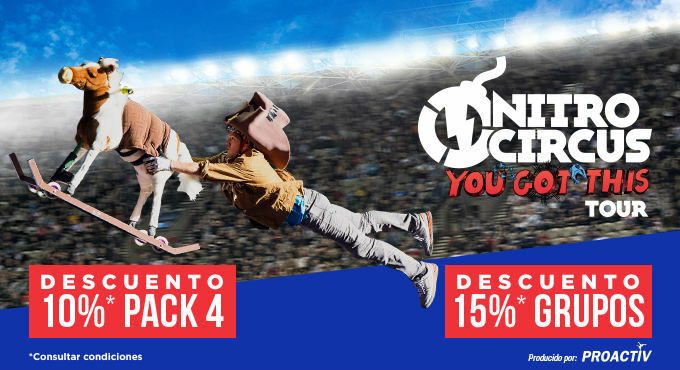 General Tickets (Prices 1, 2, 3 y 4): General access to the stadium to attend Nitro Circus. Corporate Tickets: Access to premium seats, with reserved corporate space and exclusive parking area in CC Splau *. President Club - 5 estrelles Tickets: Access to premium seats, with reserved area and parking slot in the stadium with direct access to your seats **. Executive Club Tickets: Access to premium private boxes, with exclusive private area (private lounge with sofa, fridge and TV), catering service included and parking slot in the stadium with direct access to your seats***. ***The Executive Club tickets are located in the private boxes of the stadium. Each private box has a privileged view on the field, in addition to its private area with sofa, TV and other services. The catering service is included in the price of the entrance. All Premium seats are padded, with privileged view on the field, with screens to get a closer look to the show with replays and the best tricks without missing any detail. GROUPS: Enjoy 15% discount when you buy 10 tickets or more. This discount is valid for all price zones except "Executive" tickets. Contact us on (+34) 902 731 944 (Ext. 205) or email us at grupos@proactiv.es. If interesed in "Executive" tickets please contact us as well so we can inform you how to get them. 4-TICKET PACK: Enjoy 10% discount when you buy 4 tickets. This discount is valid for price zones 2 and 3.